The International Ragdoll Cat Association (IRCA) is a small cat breeding organization devoted to the Ragdoll and related breeds such as the Honey bear and the Miracle. 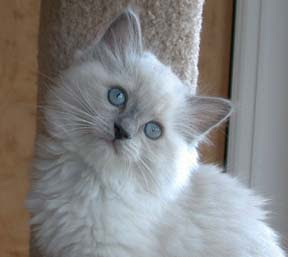 It was founded in approximately 1971 by Ann Baker, a Persian cat breeder, who established the Ragdoll breed from a unique stray cat named Josephine found in California in the early 1960s. Ann Baker, in an unusual move, spurned traditional cat breeding associations. She trademarked the name "Ragdoll" and enforced stringent standards on anyone who wanted to breed or sell cats under that name. Baker has alienated some breeders by scientifically improbable claims that her cats were genetically combined with skunks, were developed by an undercover Government project, or were related to Extraterrestrials. The IRCA is still in existence today but is quite small, particularly since Baker's death in 1997. IRCA cats are not recognized in any major cat breed organization or cat show, though some IRCA cats have been registered as "Ragamuffin" cats. The Ragamufin history and breed standard remains somewhat confused. In 1975 a husband and wife team, Denny and Laura Dayton, took a breeding pair of IRCA Ragdolls and began breeding the currently favored Ragdoll standard. The standard they developed was eventually accepted by major cat organizations such as the CFA and the FIFe. The largest international Ragdoll association is the Ragdoll Fanciers' Club International (RFCI) . At this point in time neither organization recognizes the other as legitimate.